Found in a Baltimore alley, "Whitney" now has a home. City cat caretakers know better than anyone that stray cats are in an overabundance in recent years. Many blame the economy, which may be forcing some to choose between daily necessities and their pets. Pet adoption has gone down, pet surrender has gone up and contributions to shelters are slipping. Others blame global warming in extending the cat breeding season and skyrocketing populations*. Whatever the reason for the recent feline invasion, while stray cats are considered merely a nuisance to the general population, they are considered a threat to the environment by scientists. “Cats do kill wildlife to a significant degree, which is not a popular notion with a lot of people,” he said. -But what can you do? Nobody wants to be one of those people. You know, the “crazy” multi-pet barnyard house smelling people whose pets have better dishware than they do. However, now is the time to consider sacrificing popular opinion and doing your part for a homeless cat and your community this winter and take a stray in. -And while being stray-harboring do-gooder does require some consideration, it doesn’t have to be a forever life altering event either. For suggestions on taking in stray cats, temporarily or permanently CLICK HERE. Many people will not take on another animal because they worry how their current pet will respond. Don’t assume that pets who don’t immediately get along will never get along. The larger cat in the picture above above seemed to hate Whitney, the new kitten, when they first saw one another, but through careful integration, they now sleep side by side. To get cats used to one another, keep them separated for several days and allow them to become familiar with one another through smell. Left them sniff each other through cracks in door in short intervals at first, getting longer each time. In addition, pet each unacquainted animal with a sock and then exchange it with the other. Also, a new pet doesn’t have to break the bank. To save money on pet care, consider making your own pet food. You can make the food in bulk and then freeze it in portions. It will cut down on your pet care budget and container waste. Place items in blender and serve. For variety, add broccoli, carrots, or peas to the blend. The first six months under the leadership of unelected Mayor Stephanie Rawlings-Blake has been ulcer forming for some. It is indeed stunning how seemingly comfortable Rawlings-Blake is making very controversial decisions in lieu of her path to power. For environmentalists and many of those who appreciate that which makes Charm City different from all the rest, it has been difficult to find the positives in our new city leader. -The condemning of the plastic bag tax, but then the proposal of the bottle tax. -Slashing of the Spring HAZMAT collection. -Proposed ending of bulk trash pickup. 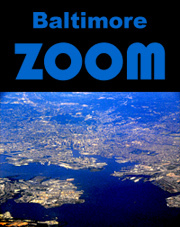 -Doubling of parking fees in “park and walk” neighborhoods such as Federal Hill and Fells Point. -Report that Rawlings-Blake was hobnobbing with “Walmart honchos” in Las Vegas last weekend. Could the next Baltimore Mayoral candidates please step forward so the sustainably-minded can have something to get excited about? How does BALTIDOME suggest we reduce the city’s deficit? For starters -Impose the plastic bag tax, put speed cameras on I-83 in the city, fine litterers and ticket drivers who do not follow the three foot rule for cyclists. Being green involves more than recycling. As the season of wedding proposals is upon us, Baltidome would like to encourage those who are considering taking the leap to SKIP THE PRECIOUS METALS AND GEMSTONES. Let’s pretend for one moment to not know all that we have learned about the human toll of diamond-mining. The typical gold wedding ring requires the removal of more than 250 tons of rock and ore (January 2009 National Geographic, The Real Price of Gold). And because much of the earth’s gold deposits have been depleted, mining companies are willing to move mountains, literally, to get it. As the earth’s gold resources are diminished, the price rises and for each ounce of unused gold you purchase, you are encouraging companies like Denver-based Newmont, who has mines on five continents, to push farther to get it. One could go on and on about the destructive practices that come from the demand for wedding rings and other high-end jewelry, but rather than examine the commercial jewelry industry, Baltidome would like to offer alternatives. By proposing with a thoughtful wedding ring alternative, you will not only protect the environment, but also create a unique wedding experience that the two of you will forever remember. Wedding Ring Tattoos – As tattoos are becoming a mainstream practice, the wearer no longer needs to be concerned about discrimination against the art form. Just make sure that you carefully design your “ring” and research your prospective parlor before you jump in. Two Baltimore parlors that have been consistently listed as “Baltimore’s Best” are Read Street Tattoo and the Baltimore Tattoo Museum. Antique Wedding Rings – If you can’t seem to break away from the tradition, but would still like to do your part for the planet, antique wedding rings are a great way to go. Many antique stores carry jewelry, but it may take some time to find the right style. Don’t be too concerned about size, as any good jeweler should be able fit the ring. Baltimore’s Heirloom Jewelry has a great reputation and an online store for easy browsing. Also, coming up is the yearly Baltimore’s Summer Antique Show at the Baltimore Convention Center, September 2-5th, 2010. There is sure to be a large selection of jewelry here, but don’t expect bargains. Request a Tree Planting – If you own your home in Baltimore and there is green space next to it, you may be eligible to request a tree planting from the city. To get more information, CLICK HERE. When your tree is planted, invite your partner to the site and propose. Adopt a Pet – Nothing shows commitment more than adopting a pet together. The Humane Society of the United States estimates that half of animals put into shelters each year are euthanized. This expression of commitment will truly be a life changing experience. For a link to the Baltimore Animal Rescue Shelter, CLICK HERE. Buy a Plot of Land – By purchasing land, you ensure what happens to it. Consider buying a vacant lot and planting a garden on it. You can then invite your partner to the location and propose. Alternatively, if your income permits, think about purchasing several acres of critical green space in another location. You could visit the space yearly with an anniversary camping trip. It is important to remember that there are powerful forces working against those that wish to challenge tradition. Offering an alternative to a newly purchased wedding ring is something you probably want to investigate with your future partner beforehand. Presenting a diva soul-mate with some acreage in the woods in exchange for a ring may come as a bit of a shock and could make for an unpleasant experience. Start out by trying to gauge where they are on the issue (such as bringing up the National Geographic article, for example). Present them with some facts and go from there. If after testing the waters, your partner keeps pointing out rings akin to The Hope Diamond, you will clearly have to discuss your intentions or you will dissapoint them on the big day. Do You Support The Clean Energy Bill? Elevation Burger has moved out of Harbor East, where, apparently, the chain could not make ends meet after less than a year. Perhaps moving to another part of town, where another popular lunch joint with organic and enviro-friendly choices (Ahem, Whole Foods) isn’t already a few steps away, would be a better maneuver. Looking for an excuse to ride the new Charm City Circulator? Well, take a trip to Diablita Cantina on the newly developed section of Central Avenue, just north of Little Italy. Diablita’s does not appear to be gunning for green business awards, but they do a lot of things right. For one, the new owners of the space (also of Red Star) have made great use of the historic Holland Tack Factory building with their new Mexican themed restaurant. By using reclaimed materials to design the restaurant, this section of the once industrial structure is transformed into a comfortable meeting space. In addition to the thoughtful interior, Diablita’s wins praise for a menu including both meat and meat-less options and, with accommodating chefs on board, they can also provide plant-only tacos, burritos and a signature vegan coconut rice. -All you have to do is ask. For refreshments, they offer the faved local Dogfish Head 60 Minute IPA on draft and American solar powered Anderson Valley Brewing Co. Beer in bottle along with many others. Last, but not least, Diablita’s margaritas are not the frozen commercial margaritas served in wide bowl glasses with a suckling straw, but each is made fresh with a hand press juicer and served, sans straw, in the perfectly sized cocktail glass. It is time to get real. The moment you buy something, that very same thing is built again, using new resources and energy. 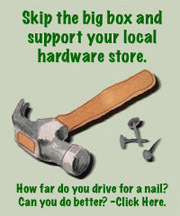 You simply can not shop your way to a greener future. A 2007 CNN report revealed a shocking study done by CIBC World Markets on green consumerism. The study showed that making consumers feel better about their shopping choices — by encouraging them to buy energy efficient products — produced one notable outcome: They bought more. The first Buy Nothing Day started in 1997. The goal is to remind us: There’s only one way to avoid the collapse of this human experiment of ours on Planet Earth: we have to consume less. To learn more about Buy Nothing Day, CLICK HERE.